NEW ORLEANS, LA. – The NOPD is asking for the public’s assistance in locating and identifying a suspect wanted for Shoplifting. The incident occurred January 28, 2015, inside of Prima Donna Closet and Lagniappe located at 927 Royal Street. At approximately 2:20 p.m., the suspect entered the store and walked to the front display window. The suspect picked up a pair of burgundy Tory Burch shoes, concealed them underneath his clothing and walked out of the store without paying for them. Below are photographs of the suspect. NEW ORLEANS, LA. – The NOPD is asking for the public’s assistance in locating and identifying two unknown males wanted in connection with a burglary that occurred at Melvin’s Bar located at 2112 Saint Claude Avenue. The incident occurred on Wednesday, February 4, 2015. Around 3:45 a.m., the suspects entered the closed business through a rear door. Once inside, the suspects stole four safes containing a combined cash value of over $10,000. The suspects fled on foot eastbound on Saint Claude Avenue. Still photographs of the suspects can be viewed below. Eighth District Detective Jerusha Carroll is in charge of the investigation and can be reached at 504-658-6080. Crimestoppers is offering up to a $2, 500 reward for information leading to the arrest and indictment of the person(s) responsible. Citizens with information regarding this crime are asked to call Crimestoppers at 822-1111 or toll free at 1-877-903-STOP (7867). Callers do not have to leave their name nor testify in court to receive the reward. Citizens can also submit an anonymous tip online to Crimestoppers at www.crimestoppersgno.org. NEW ORLEANS, LA. – Yesterday, the NOPD arrested 38-year-old Woodrow Johnson in connection with the shooting death of 29-year-old Joshua Jackson. The incident occurred February 5, 2015, outside the gate of a car body shop in the 7500 block of Chef Menteur Highway. At approximately 12:02 p.m., police responded to a call of a male down outside the gate of a car repair body shop. When officers arrived, they found the victim shot multiple times lying on the ground next to a fence. He died on the scene. During the course of the investigation, Detective Debra Normand was able to develop Johnson as a suspect and learned that he wanted to turn himself in. Detectives met with Johnson and relocated him to the New Orleans Police Headquarters. Detectives served a search warrant on a residence and located a handgun. Johnson did not give a statement and was accompanied by his attorney. Johnson was booked into Central Lock-Up and charged with one count of Second Degree Murder. NEW ORLEANS, LA – According to the annual Uniform Crime Report (UCR), the number of murders in New Orleans reached a 43-year low in 2014. At 150 – the lowest number of murders since 1971 – the downward trend represents the third consecutive year that murders have declined in the city and the lowest murder rate in over a decade with 39.6 victims per 100,000 people. Overall, crimes against persons increased by 27.15%, and crimes against property increased by 12.78%. To address this issue, Chief Harrison created a Violent Crimes Task Force, comprised of 16 officers, that focuses on crime hot spots across the city each night. These proactive patrols provide visibility to help prevent crimes, and allow officers to respond more quickly to crimes in crime hot spots. “The Task Force has been very effective, and I credit the brave men and women that work in this unit with making important arrests in a string of armed robberies in New Orleans East, Uptown, and the French Quarter,” said Harrison. To continue to flex the manpower of the NOPD, Chief Harrison has moved 25 officers from administrative duties to street patrols. He has also successfully enhanced the NOPD Reserve Unit, recruiting more than 100 former police officers to volunteer to assist with street patrols. In 2015, the NOPD will continue its aggressive recruitment campaign. Two classes of NOPD recruits are currently in training at the Academy. For more information or to apply, visit JoinNOPD.org. NEW ORLEANS, LA. – The NOPD has arrested 18-year-old John Gilmore, 18-year-old DJ Don Murphy and a 16-year-old male and booked them with five counts of Auto Burglary. The incidents occurred during the month of January 2015. The suspect’s burglarized vehicle’s on Vivian Court, the 3500 block of Hyman Place and the 3500 block of Plymouth Place. During the course of the investigation detectives identified and located the suspects. The suspects were taken into custody and all three were booked with five counts of Auto Burglary. Below are photographs of the two adult suspects. Fourth District Detectives are in charge of the investigation and can be contacted at 658-6040. NEW ORLEANS, LA– The NOPD is asking for the public’s assistance in identifying a pair that robbed a man in the 12300 block of the I-10 Service Road. Around 10:30 p.m., a 25-year-old man told police he was smoking a cigarette in the parking lot of an apartment complex when he was approached by two unknown females. Moments after conversing with the females, an unknown black male walked up and demanded the victim’s money after implying he had a pistol in his pocket. The victim feared for his safety and handed the suspect $160 in cash. The suspect ordered the victim to ride with one of the females to an ATM to get more cash. The victim drove with the female to an ATM in the 7000 block of Bullard Avenue. The victim withdrew $200 in cash and gave it to the female. The victim drove the female back to the apartment complex, where she and the male suspect fled in an unknown black SUV. The male suspect is described as a black male, muscular build, light complexion. He was last seen wearing a grey long sleeved shirt and blue jeans. Video surveillance in the area captured video of the female suspect and it can be viewed below. The Seventh District Investigative unit is in charge of the investigation. 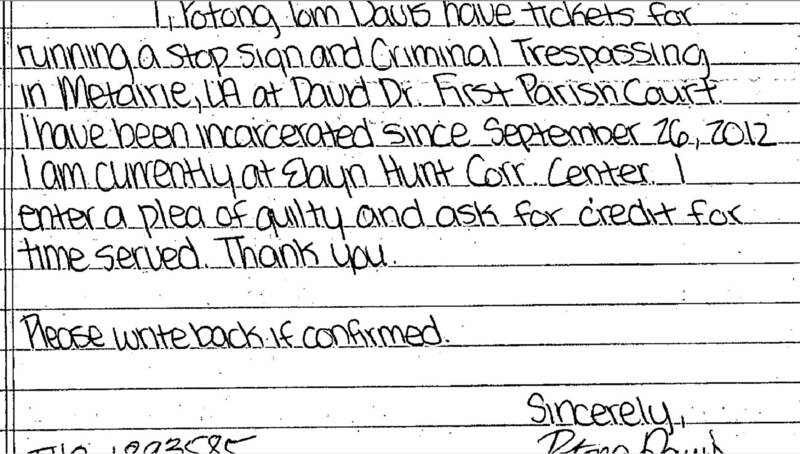 As predicted Jovon Murrey involved with the Bourbon Street jail is no longer at JPCC Jefferson Parish jail. This is related to the three that were arrested in Jefferson Parish. It would appear these arrests are related to a fight recorded on video and arrests warrants issued out of Orleans Parish. The video went semi-viral at least locally. Two of the people in custody appear to be dealing with Jefferson Parish issues first. It would appear Jovon Murrey may be transferred to Orleans at any time to face his charges which are expected to be minor such as trespassing and disturbing the peace. Jovon Murrey – He was released from JPCC 2/7/2015. I am not sure why he was ever in custody in JP. In custody in Jefferson Parish arrested 02/06/2015 being held currently as a fugitive. I assume this is an arrest warrant out of Orleans but will know for sure on Monday. FUGITIVE I assume this is an arrest warrant out of Orleans but will know for sure on Monday. 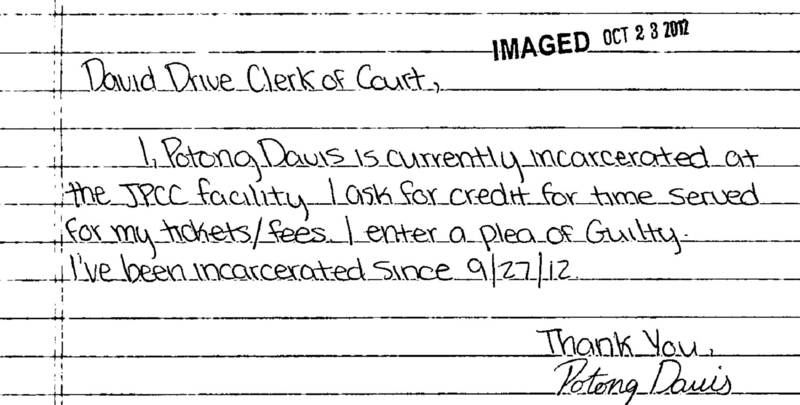 Here is another letter he sent asking for time served. To date he has still not paid the balance in FULL! This is the video that has so far resulted in 3 arrests and 1 additional warrant and is still live on social media. It would appear that Social Media is the key avenue that led to the arrests and future criminal charges in this matter.